PRESS RELEASE (WLS) -- An official rite of spring in Chicago is opening day at Wrigley Field and ABC7 will be there for the much anticipated Cubs home opener against the Pittsburgh Pirates with an extended pregame special airing Monday, April 8 from Noon right up to the first pitch at 1:20 PM. 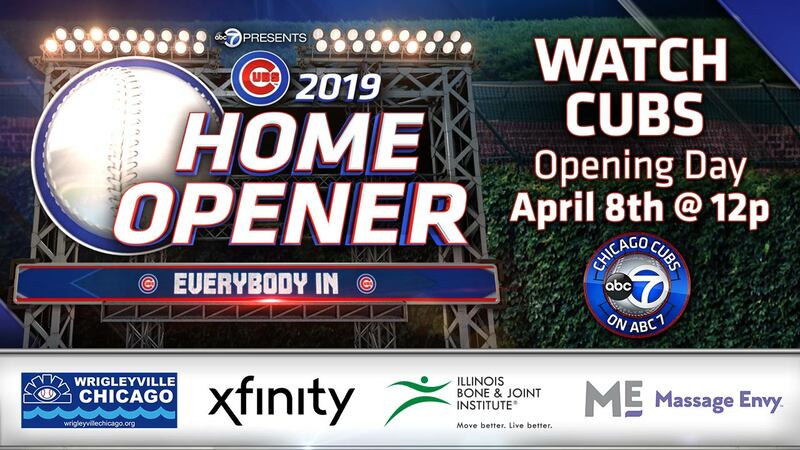 The ABC7 sports team, Mark Giangreco, Jim Rose and Dionne Miller, along with Windy City LIVE's Ryan Chiaverini and Val Warner will give Cubs fans a front row seat, LIVE, from Wrigley Field. Native Chicagoan, lifelong Cubs fan and star of ABC's hit show THE GOLDBERGS, Jeff Garlin, will talk about his favorite team, also live from Wrigley. The special will kick off ABC7's 2019 broadcast of Chicago Cubs baseball which will feature a 25-game schedule. Putting last year's wild card loss behind them, Cub fans are rooting for their team to be World Series contenders in 2019. This pregame special will analyze what Cubs fans can expect this season and will recap their road trip games against Texas, Atlanta and Milwaukee. We'll hear from Joe Maddon, Theo Epstein, Tom Ricketts and of course the Cubs players themselves. Ryan Chiaverini will feature Cubs players in his popular Two-minute Warning segment. Also on deck -- a look at everything going on around the 'friendly confines' for the Cubs faithful including some of the best places to eat, before and after the game! General Hospital will air in late night at 1:05 AM, Jeopardy will air at 2:05 AM.